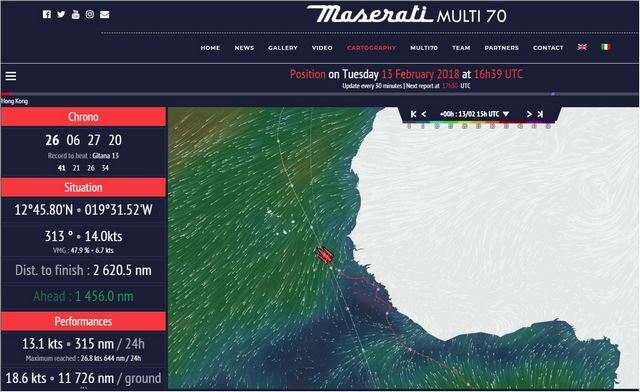 Maserati Multi 70 slowed down this morning less than 150 miles off Liberia's coasts. According to the weather forecast, we will have to deal with light and very unstable winds in order to pass the doldrums, called "pot-au-noir" in French. “We get in and out squalls and no wind zones, from 30 knots storms to dead calms”, Giovanni Soldini tells the difficult sailing conditions the crew had to deal with yesterday, typical of the doldrums. For several hours, the trimaran has been approaching the coasts of Sierra Leone because, explains Soldini: ”We must pass to the East of the tropical depression we have in front of us, this will force us to go very close to the coastline”. 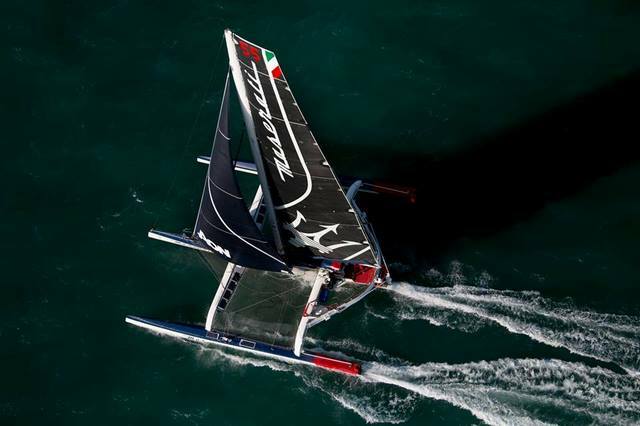 At the 8.34 UTC rankings, the advantage of Maserati Multi 70 over the previous record is 1.851 miles. 3.026 remaining miles to the finish line. 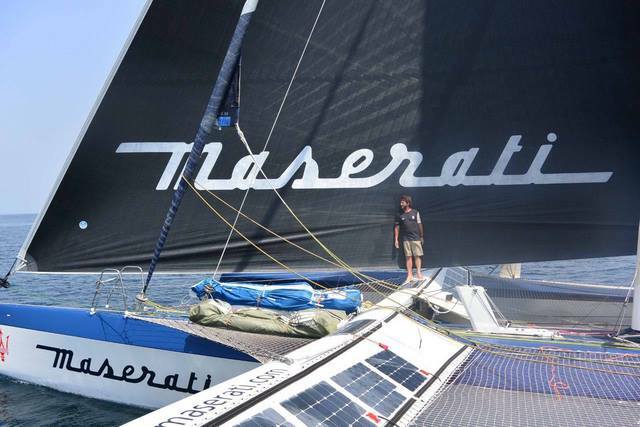 Finally trade winds for Maserati Multi 70, skipper Giovanni Soldini and his crew (Guido Broggi, Sébastien Audigane, Oliver Herrera Perez and Alex Pella). After struggling for two days to pass through a tropical depression, this night just before dawn, the trimaran entered the range of north eastern trade winds, meaning constant winds. It’s the beginning of a long starboard tack that will allow the Maserati Multi 70 to head north maintaining good speeds. However, the current weather situation and what is expected for the next few days do not correspond to the classic scheme, as Soldini explains: “The Azores high pressure has unusual forms and positions. Today it is a strip that stretches from the Strait of Gibraltar to Florida. In the next 4/5 days, it is expected to extend from Ireland to the Azores. And this does not look good for us because it will bring cold and strong winds from East/North East, that is to say, contrary winds. We hope that the models are wrong or change in the meanwhile. Now we are concentrating on our trajectory and we are monitoring the weather evolution looking for some opportunities to go as fast as possible without extending the route”. After 26 days of navigation, at the 10.46 UTC rankings, the advantage of the Maserati Multi 70 on the record holder’s roadmap is 1.515 miles. 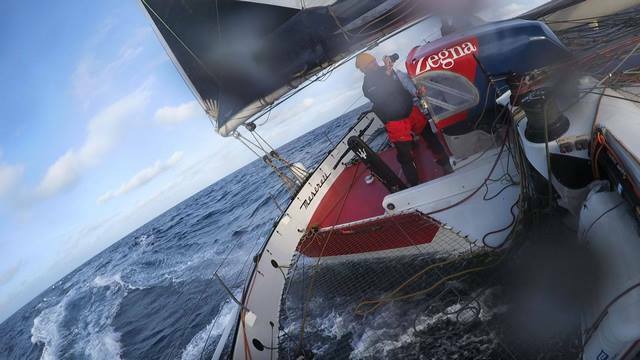 There are 2.684 miles left (of the initial 13.000 nm) to the finish line in London. 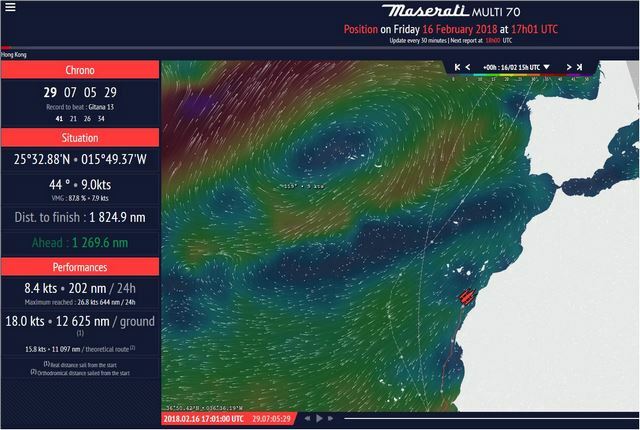 The twenty-sixth day of navigation begins about 40 miles off Guinea for Maserati Multi 70, still struggling with the very light winds of the tropical depression which is slowing down its progression towards North. Reached this morning, Giovanni Soldini explains: ”The center of the depression moves quickly. This night it stopped us again for a few hours. Right now it’s heading West and we have only 5 knots from South East that should stabilize later around 10 knots. We are going through the last difficult passage before conquering the north eastern trade winds we should reach next night at about 10°30’N and 17°W”. The waypoint indicated by Soldini is located at SW of Guinea Bissau, about 150 miles of the trimaran position at 10.26 UTC. 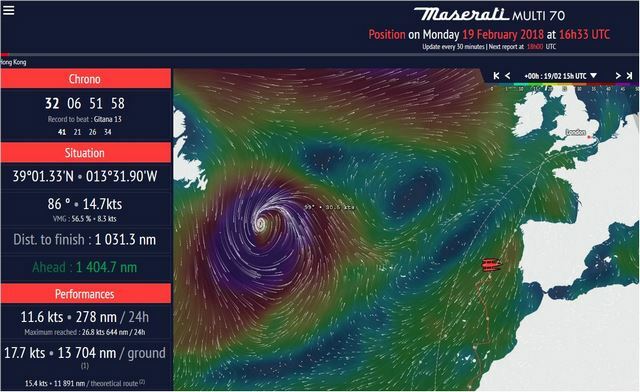 Last night, Maserati Multi 70 tacked and headed towards the coastline, before tacking again just 30 miles off Dakar. Always upwind, the route followed this morning (335° i.e NNW) is more favorable than the NW route followed yesterday afternoon because it’s more directly towards North. It remains the unknown factor of the passage of the high pressure very unstable these days. Will it be necessary to make a detour up to the Azores archipelago or will it open a shorter passage passing further East, near Madeira islands? At the 9.19 UTC rankings, there remain 2.449 miles to the finish, 1.262 miles ahead of the roadmap. 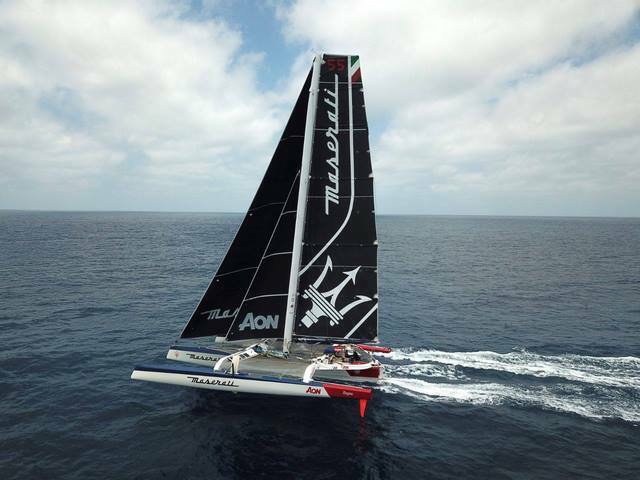 At 10 UTC, Maserati Multi 70 is sailing at 14 knots off the Mauritania, at about 200 miles to the south of the Canary Islands. 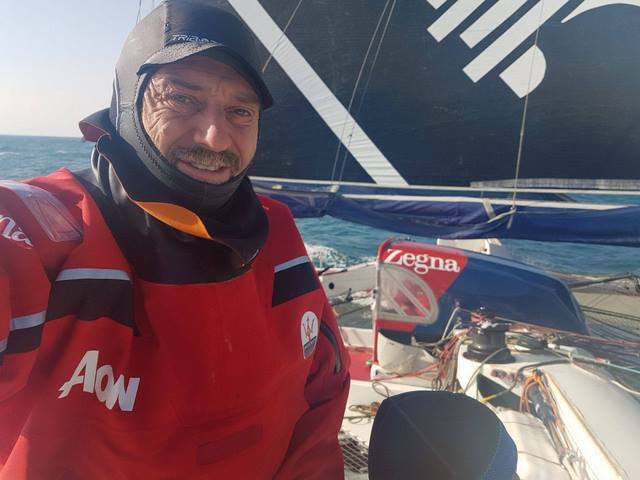 In the last 24 hours, the trimaran has followed a parallel route and very close to Western Sahara coastline “to find some wind and continue to sail correctly” as Alex Pella explains in his diary. Coastal navigation complicates everything because, Pella continues: “marine life is much richer than near the coast than offshore so the traffic is much more important, from large merchant ships to smaller vessels dedicated to cabotage through small fishing boats very numerous in this area, so we must be very careful”. 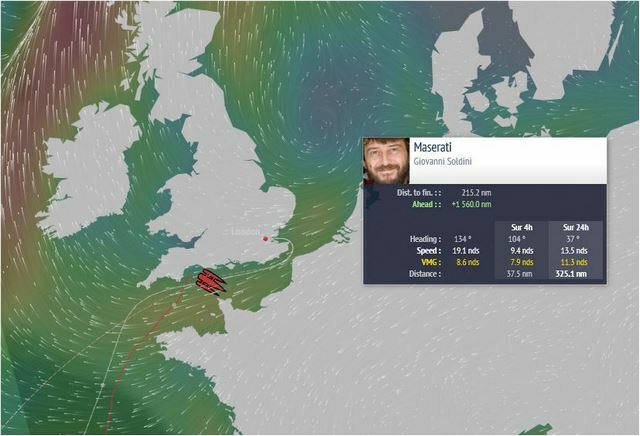 At the same ranking, just before the beginning of thirtieth day, Maserati Multi 70 is located at 1.894 nautical miles of the finish line with a 1.275 nm advantage on the record. If they don't run into something, they look like they might have the record by this time next week. After passing the latitude of Gibraltar (36° N) last night, Maserati Multi 70 tacked and started heading towards the coasts of Portugal. 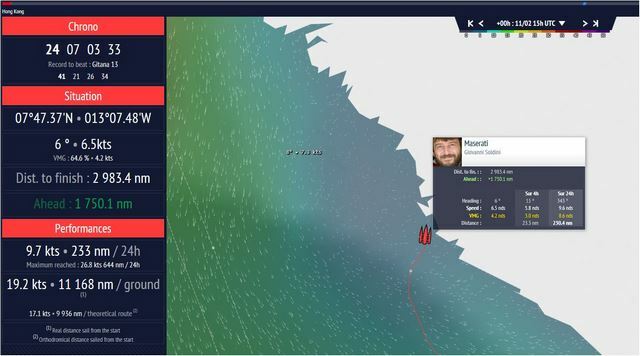 For the skipper Giovanni Soldini and his crew (Guido Broggi, Sébastien Audigane, Oliver Herrera Perez and Alex Pella) the navigation of the last part of the route of the record Hong Kong-London is confirmed upwind, against contrary winds. 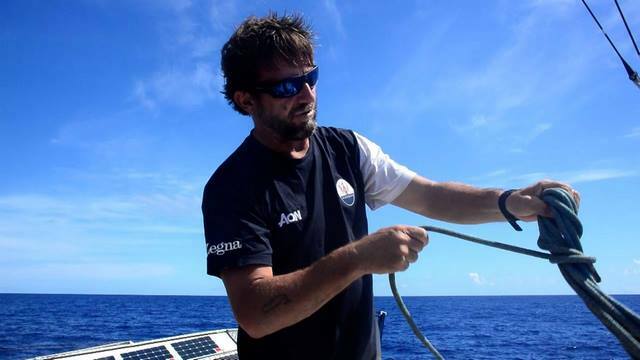 “We must try to go as fast as possible“, continues Soldini, “because later we will arrive in the Channel, the more wind we will have; but at the same time we have to take care of the gear and the boat that suffer more when sailing upwind. The strategy is to navigate near the coastline, in order to have less swell and current. Then it will be necessary to manage the currents of the Channel in a good way. In the upcoming days, the tide coefficients are high and therefore strong currents are expected. Paradoxically it is worse to have the current in favor and the wind against because it generates a very steep and dangerous sea. We’ll have to be very careful“. 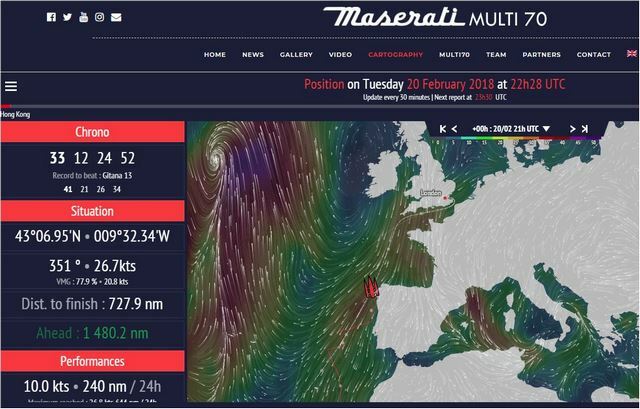 After almost 32 days of navigation, at the 6.56 UTC rankings, the advantage of Maserati Multi 70 on the the record holder’s roadmap is 1.375 miles. 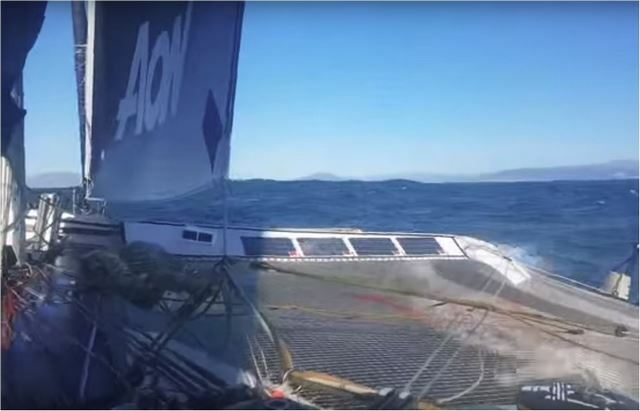 There are 1.136 miles left (of the initial 13.000 nm) to the finish line London. The arrival is currently scheduled for the morning of February 23rd. That is a pretty serious looking system escorting them to the finish! 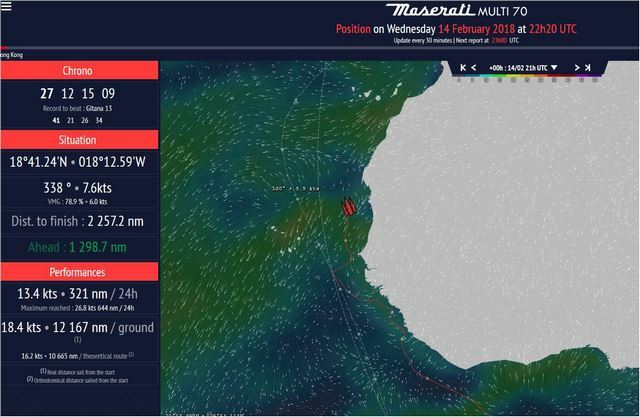 At 9.31 UTC, Maserati Multi 70 is about thirty miles off the Portuguese coast, just south of Porto. Cape Finisterre, the northwestern tip of Spain, is 130 miles to the north. After Finisterre, the crossing of the Bay of Biscay will begin, another 350 miles to reach the tip of Brittany. Always upwind with more tacks to do to go to the North. At the same ranking, the advantage of Maserati Multi 70 rose to 1.444 miles. 862 miles left to London. They are in the English Channel now! Maybe drinking some Lipton's tea? 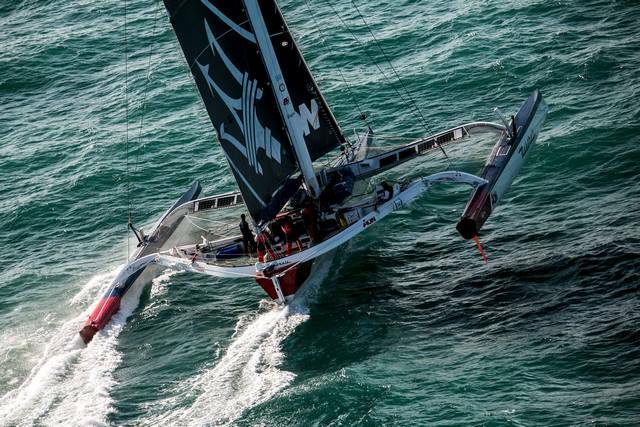 Maserati Multi 70 entered the English Channel before dawn. 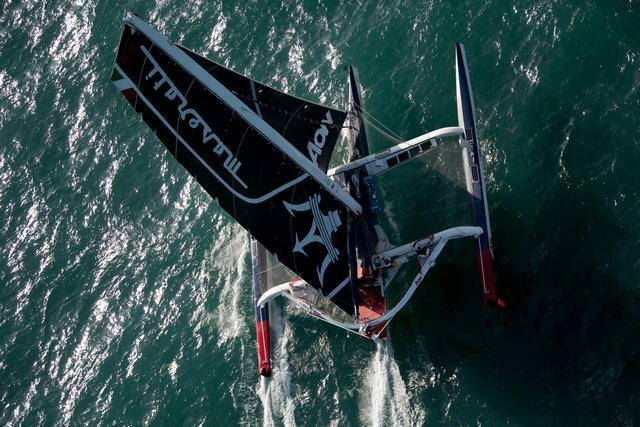 After a very fast night thanks to the wind which veered to the East and allowed the crew to conclude the crossing of the Bay of Biscay on the direct route to the tip of Brittany, at 6.34 UTC ranking, the Italian trimaran was located a few miles north of the island of Ushant. Of the remaining 344 miles to the finish line, 300 are the distance between Ushant and the Strait of Dover: all the Channel to sail upwind with important tidal currents and a very dense maritime traffic. These are the last 300 miles before turning left and start the last part of the route, climbing the estuary and the river Thames up to London. 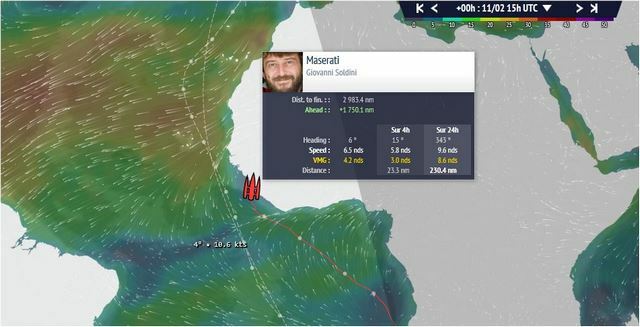 Giovanni Soldini comments: “Here we have a wind that blows from the east and forces us to go up the Channel tacking upwind with a freezing cold. We expect the wind to increase up to 22/25 knots in the evening. We will pass Calais next night at around 4 in the morning. Navigation is very tough in the Channel, there is a lot of traffic and rules that we have to respect. Everything is all right on board, morale is high”. After almost 35 days of navigation, at the 9.34 UTC rankings, the advantage of Maserati Multi 70 on the record holder is roadmap is 1.564 miles. 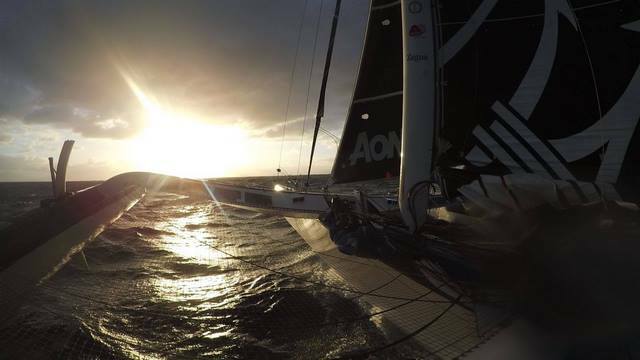 There are 302 miles left (of the initial 13.000 nm) to the finish line in London. The arrival is currently scheduled for the morning of 23 February.